Consequences of Inactivity: the “M” Words, Weight Loss, and You! 3. Your Physical Activity Energy Expenditure (PAEE). The resting metabolic rate (RMR) reflects the number of calories you burn to maintain your body processes when you are at rest (sleeping, watching TV, sitting at your desk); it’s about 65-75% of your total daily calorie expenditure. The thermic effect of food (TEF) reflects how many calories you burn throughout the day digesting food; approximately 5-10%. The third component of your metabolism, the physical activity energy expenditure (PAEE), is the most varied percent range (15-30%). How much above your RMR can you rise if you become physically active? It depends. People who exercise regularly develop more muscle mass, which increases the number of calories they can burn each day. To illustrate; a pound of muscle uses six calories a day to sustain itself. On the flip side, a pound of fat burns only two calories per day. That difference may not sound like a lot, but over time it really adds up. So here’s the mathematical formula you need to memorize: RMR (doing nothing) + TEF (digesting food) + PAEE (physical activity) = Your Metabolism. I’m not a math geek, but even I can see that adding physical activity into your daily routine will benefit your weight loss goals by increasing your metabolism. 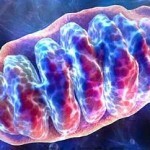 Mitochondria are tiny bean-shaped ‘organelles’ inside your muscle cells. The more exercise you do, the more your mitochondria grow in size and number. In case this didn’t sink in, I’m going to repeat it: the more exercise you do, the more your mitochondria grow in size and number. The reason this is so important is because mitochondria are like little furnaces that chew up fats and sugars and spew out energy for your muscles to use. And they do it on demand. As you run, cycle, or swim, the mitochondria have to crank out more energy and consume more fat and sugar. At lower levels of intensity, your mitochondria can consume the bulk of their energy needs from fat. But as the intensity of your activity increases, they will begin to use muscle sugar (glycogen) as well. If you have only a few mitochondria in your muscle cells, there will not be much fat and sugar burning action going on in there. Let’s say you took to heart what I just shared with you at the beginning of this article about your PAEE/metabolism. You decide to start exercising daily. At first, you will probably get tired and/or winded because there aren’t enough mitochondria to keep energy flowing to the muscles. But, (and here’s the awesome part), by the end of your exercise session your muscles will be producing more mitochondria. Eventually your muscle fibers will be stuffed full of mitochondria. Now exercise will get easier. You will be able to exercise longer with less effort. And here is where all this information leads to weight loss. Your muscles start to burn more fat and sugar all the time – because mitochondria don’t sleep. Your ability to burn calories and lose weight has increased exponentially because you added physical activity to your daily routine. Mm, Mm, Good! Something so simple has compelled me to want to exercise more and be consistent about it. Now I understand why it is so hard to get started and stay started because I am not consistent with it. Great little article with a lot of power if used! Thanks for the comment. I agree staying on track means doing something everyday. Yes you can teach an old dog something new. I did not know about Mitochondria. This makes so much sense. The more you exercise, the easier it gets. And hear I thought I was only building up endurance. soo I guess I’ll just sum it upp what I had written and say, I’m thoroughly enjoying your blog. I as well aam an aspiring blogg writer but I’m still new to everything.